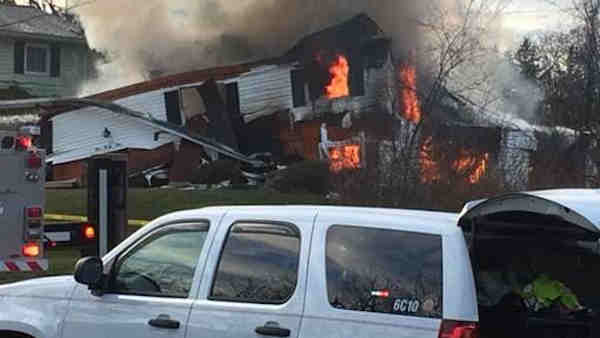 HENRIETTA, New York -- Authorities said no injuries are being reported at a suburban Rochester home that exploded after the homeowner's car hit a natural gas line on the house. Officials said the explosion occurred shortly before 8:30 a.m. Tuesday at a home on Buckley Place in the Monroe County town of Henrietta, just south of Rochester. WHEC-TV reports the sheriff's office said the 79-year-old homeowner crashed his car into the gas meter. The man heard the sound of gas leaking and got his wife out of the house. Deputies say the couple was at a neighbor's home to call 911 when the house exploded. The blast destroyed the two-story ranch-style home and caused a fire. Emergency crews remain at the scene.